When you are shopping for a sewing machine, being drawn to a machine with all the bells and whistles you can afford is not unusual. Now that you have those stitches how are you going to use them and when will you use them? The more elaborate (or expensive) your sewing machine is, the more stitch options the machine will have. 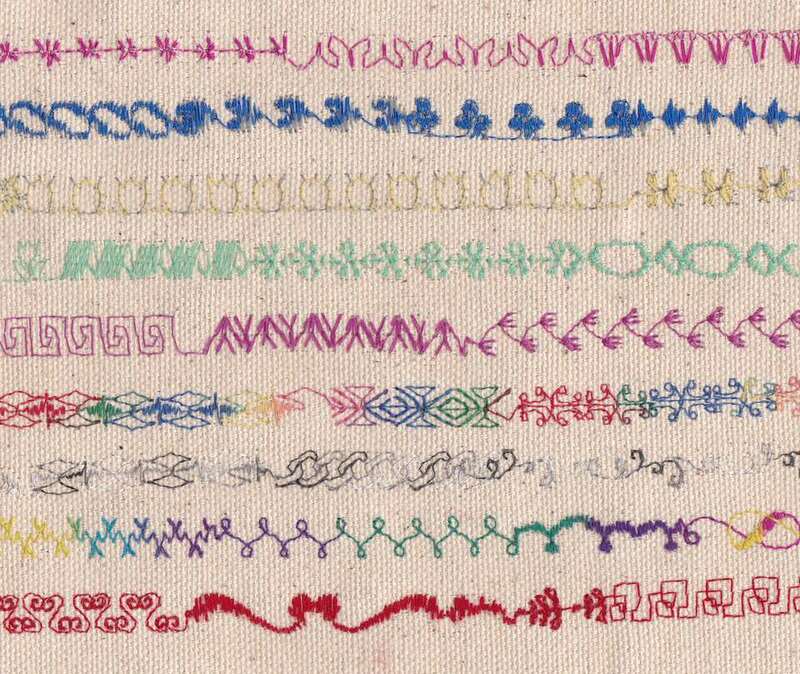 Most people rarely use all of the decorative stitch options but they are nice to have for embellishing and decorating. They allow you to be as creative as you want to be. Experimenting with the many types of thread is one way to expand on the decorative stitching. Using bobbin thread when sewing decorative stitches helps eliminate a heavy bobbin thread area. Be aware of the length of patterns repeating and a continual stitched area such as around a continuous neckline, so that the stitching overlaps appropriately at the end of the stitching. Testing the stitching on an equal length is the best way to assure that the stitching will have the proper placement. Many decorative stitches are very dense and difficult to remove the stitching if you are unhappy with it once it is sewn so always test your fabric, thread and stitch combination on a sample before you sew it on your item. The amount of thread a design uses should also be taken into consideration if you do not have a lot of a particular thread on hand. The distance between repeated colors in variegated threads is a variable and should also be tested on a sample before you sew it on your item. In many cases, you may need to experiment with stabilizers that are used in machine embroidery to obtain smooth consistent decorative stitching. Take time to understand the basics of machine embroidery so you can make the best stitching possible. Adjustments to a straight stitch are the stitch length. A very small short stitch is tight and difficult to remove while the longer the stitch the easier it is to remove. The longest possible straight stitch is considered a basting stitch which is meant to be removed. When a straight stitch is puckering your fabric, it can usually be resolved by lengthening the stitch length. tension adjustments are available for the upper thread on the sewing machine and by way of a screw on the bobbin case. Always refer to your sewing machine manual before making adjustments. Needle position can be changed on your sewing machine when you are sewing a straight stitch. By changing the needle position, you can change the guide you are using to maintain sewing straight lines exactly where you want them. The amount you can change the needle position is ​dependent on your sewing machine options. Machines that have a zigzag option, have at least three needle positions. The minimal needle positions would be right, left and center. A zigzag stitch is similar to a continuous row of the letter W, with each w connected to the w on each side of it. The most common use of a zigzag stitch is to enclose raw edges as a seam finish. As a seam finish, one edge of the stitch is sewn off the edge of the fabric so that the threads of the fabric are enclosed within the threads of the zigzag stitch and the fabric is unable to fray because of the zigzag stitch. The length and width of a zigzag stitch can be adjusted. The shorter the stitch length the narrower the W formation will be. The stitch width adjusts how wide the W formation will be. A zigzag stitch is also used as a stretch stitch when other options are not available. By sewing a seam with a narrow zigzag stitch rather than a wide zigzag stitch, the stitching will stretch with the fabric, if you are sewing a stretchy or knit fabric. A Stretch Zigzag Stitch: A stretch zigzag is a stitch that has stitching throughout the W formation which allows the stitches to stretch without the thread breaking. This is the best to use on stretch fabric so the stitching can be depended on to hold the fabric without breaking. A blind stitch is not on all sewing machines but is a common stitch. A blind stitch is used to sew hems in place with the minimal amount of stitching visible when you have sewn the hem. This stitch can save you many hours of hand sewing. A straight blind stitch and a stretch blind stitch may be available on your sewing machine. The kind of fabric will be the deciding factor for which type of blind stitch you should use. A stretchy fabric would use a stretch blind stitch and a woven or non-stretch fabric would use the straight blind stitch. As always, the manual for your sewing machine is the best source of information for sewing a blind stitch with your sewing machine. Many sewing machines do not have a stretch stitch built in while others have an assortment of stretch stitches. A stretch stitch is what you will commonly use if you plan to sew stretch fabric. This stretch stitch is a perfectly straight stitch but it allows for stretching without the stitching popping or breaking which is what would happen if stretching a regular straight stitch. Sewing a bias seam is another reason to use a stretch stitch. A basic sewing machine with nothing more than a straight stitch and a zigzag stitch can sew a stretch stitch by using a narrow zigzag stitch. That narrow zigzag will allow the seam to stretch. When in doubt or unsure of who something will work out, use fabric scraps to practice and see the finished stitch before sewing on the garment or item.